Alexis Hall, Dabney Grinnan and I are at All About Romance today with a glowing review of Against the Dark by Carolyn Crane. I can’t believe it took me so long to read one of her books, particularly after last year’s RITA win. I already started the second one, but got sidetracked by other commitments. I can’t wait to get back to it! 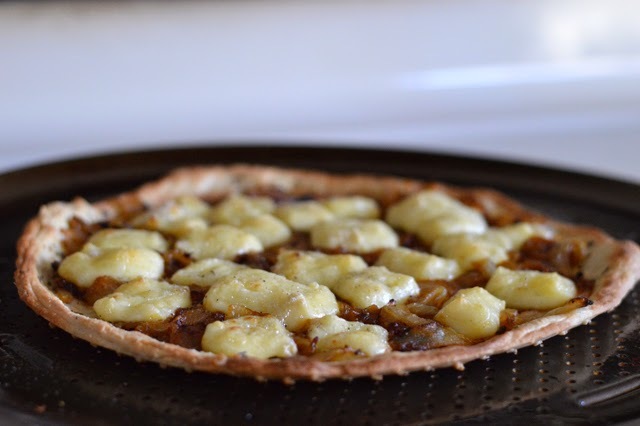 There was also carmelized onion and brie pizza in this book that I just HAD to try out so I’m giving readers a bonus recipe today too so just scroll down for that. And head over to All About Romance for the review. As long as I’m here though, I wanted to say a few things about trust and relationships and make sure that I’m being as transparent as I can be. It shouldn’t be any kind of secret by now that Alexis and I are friends who chat pretty often since we review together once a month, but I have plenty of relationships like that with other authors too. All those relationships are disclosed in the body of review posts as I don’t avoid my friends’ books. I’ve talked about this before so I hope that’s not news. In many cases, I became friendly with authors after reviewing a book of theirs for the first time so the first post about an author might not have that sort of disclosure. It’s a peculiarity of reviewing the way I do (a creative interpretation of another creative’s work) that these relationships typically develop unbidden and I’ve not seen a reason to resist them. But it means that my blog has never been and will never be a “reader’s haven” in the same way other review blogs are. If you’re looking for that, Wendy the Super Librarian, Miss Bates Reads Romance, Immersed in Books and Feminist Fairytale Reviews are a few of my personal favorites. In addition to maintaining friendly relationships with a pretty wide range of authors, editors and other reviewers via Twitter and email, I also do a fair bit of beta reading, which I also disclose when I review those authors. Sometimes my involvement is slight (proofing a food-related scene), sometimes it’s more extensive (reviewing a manuscript at several points pre-publication). I will always say I beta-read the book in these cases, or if I have beta-read for the author in the past. I really genuinely love helping my friends with their books–it’s one of the unexpected joys of having come to romance reviewing–so I don’t ever want to give that up. Finally, as far as my own ambitions are concerned, I have no plans to write romance fiction. That said, and I’m guessing this won’t be a surprise to many given how many times I’ve been asked if I’d ever write a romance-related cookbook one day, I would like to write a cookbook. Someday. And I have no idea yet what shape that might take. If I ever do, it will be under the name Elisabeth Lane, which is a pen name and the only name under which I have ever written and ever will write anything remotely related to the romance genre. I’ve never been careful about privacy under my given name and when I started reviewing, I thought it best not to be quite so obviously easy to find, hence the pen name. If I ever change my mind and start publishing anything romance-related under my given name or any other pen name, I will disclose it. Sorry for the serious turn, but I thought it was important to make sure all that was out in the open in the wake of the events of the last few weeks. So let’s get to cooking without further delay! This recipe definitely falls under the heading of “not pretty, but sooo delicious”. I mean, just look at those lumps of brie! 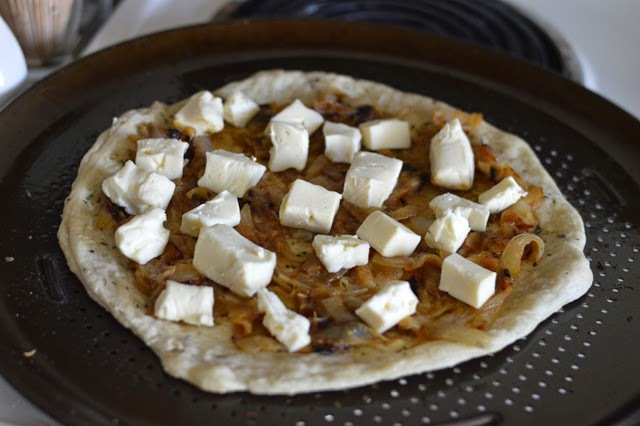 My husband assures me that artisan pizzas pretty much all look like this now and I know he’s right–globs of real mozzarella, ricotta, etc.–but I can’t help but wish it were just a little less beige. It’s alright though. The flavor more than makes up for the humble visual. Have we talked about pizza dough? I’m not sure we have. 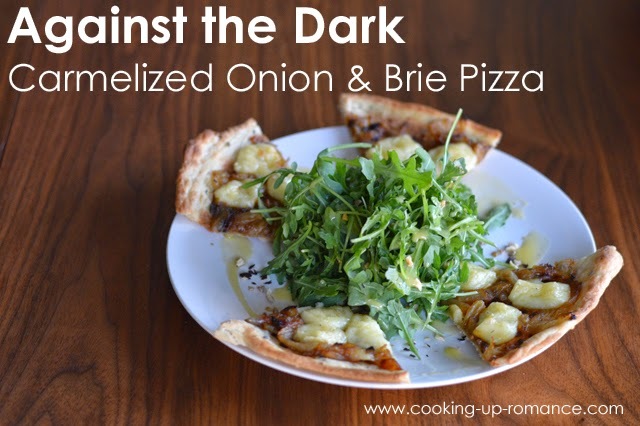 But when carmelized onion & brie pizza popped up in Carolyn Crane’s Against the Dark, I just knew I had to try it out. I make homemade pizza about once a week. I mix up a huge batch of dough once every month or two and freeze each lump individually wrapped in plastic wrap and put all together in a freezer bag. 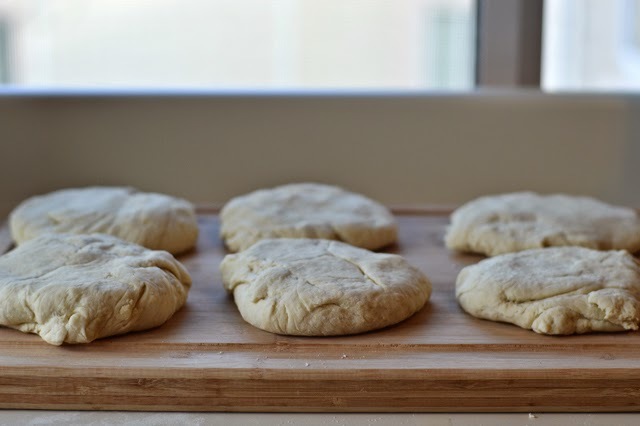 It works pretty well and I always have pizza dough for a quick weeknight meal. I served this pizza with a pile of argula in a super simple dressing of oil & champagne vinegar with honey and a tiny bit of salt of salt and pepper. Oh, basically this recipe from my review of the Ruthie Knox book Truly. The brie makes this pizza quite filling so the light salad was plenty adequate as a side. I don’t suppose I need to make a case for the pizza, but I will. The slow-cooked onions and creamy brie with an underlying hint of Herbes de Provence was completely delectable, as I suspected it would be. 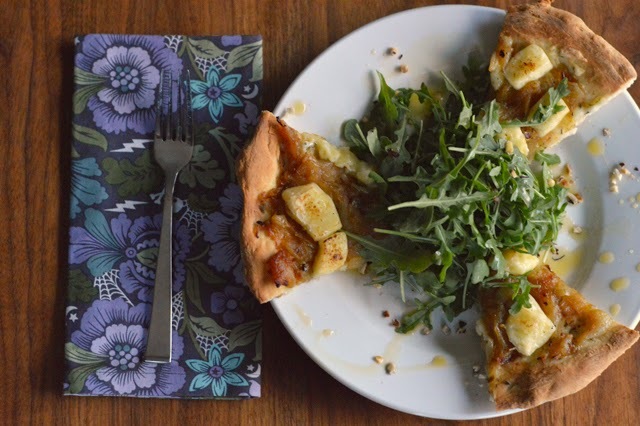 Piling the arugula on top of a pizza slice was a pretty darn good move too. You should probably only make this for someone you really like a lot. 1. Make pizza dough or use store-bought. Preheat oven to 425 degrees F. Stretch out pizza dough and put it on pizza pan sprayed with cooking spray to prevent sticking. Baste crust with 1 teaspoon olive oil and scatter Herbs de Provence over the crust. Pre-bake for 9 minutes, then remove and allow to cool while you make the onions. 2. Add 1 tablespoon olive oil and 3 tablespoons unsalted butter to a large skillet with a lid. Heat over medium heat until butter is melted, then add sliced onions and cover. Cook, stirring occasionally, for 10 minutes. Remove the cover and set aside. Add 1/4 teaspoon salt, 1/2 teaspoon sugar (to promote browning) and black pepper. 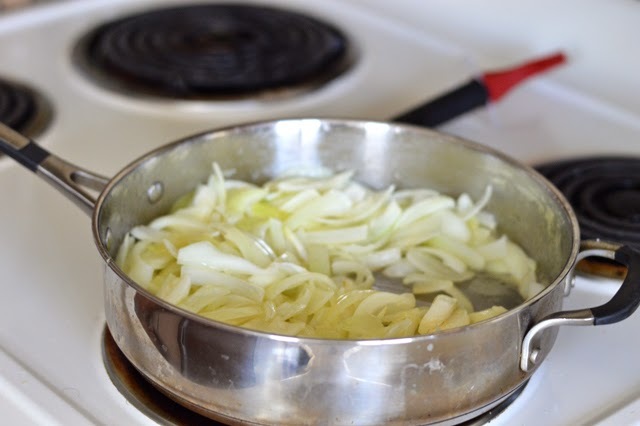 Turn down the heat to medium-low and cook for 20-30 minutes, stirring frequently, until onions are thoroughly carmelized. 3. When the onions are done, spread them evenly over the pre-baked crust. Add chunks of brie on top and return to the oven for 7-8 minutes. When the crust is nearly brown, put the pizza under the broiler for a minute or 2 until the brie is lightly browned on top. Allow to rest until cheese stops bubbling, then slice and serve.